I love eating (and making) gnocchi and this, pared with mushrooms is to me, just wonderful!! In a bowl, using a wooden spoon, mix together all the ingredients until evenly mixed. Let the mix rest half an hour in the fridge to firm up. Divide into three balls and roll them into even sausage shapes, handling them lightly. 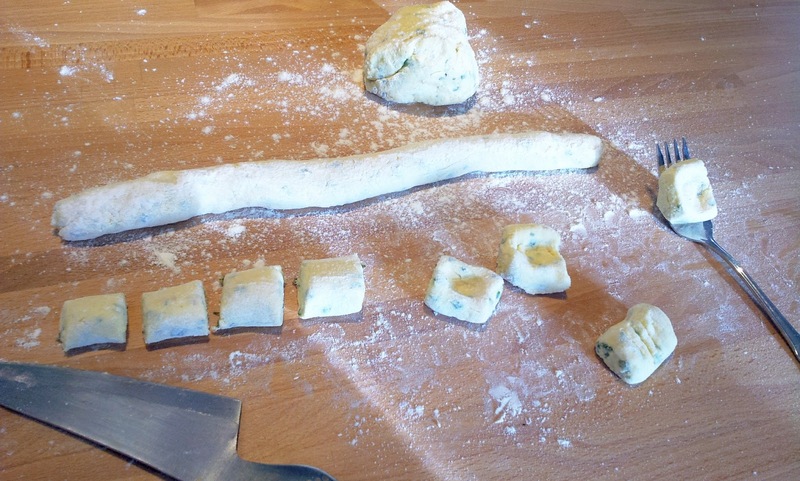 Divide into equal pieces, then pressing on a folk roll away the gnocchi so you have a indentation one side and lines on the other side (see photo - it would be more pronounced if making potato ones, but these are quite delicate). They need to be cooked straight away or back into the fridge (no more than a few hours) . For cooking, bring a pan of salted water to the boil, putting them in gently. When they rise count to ten and with a slotted spoon remove them to your awaiting sauce (see below - using girolles and butter here). Clean the mushrooms with a brush and cut the larger ones so they are all even, trimming any very dirty or sandy parts. In an open non-stick pan with a few tablespoons of olive oil, add the mushrooms with some salt and keep turning them for about seven minutes. Add in two heaped tablespoons of butter at the end and put the pan to one side keeping them warm while you cook the gnocchi. Put in your gnocchi with four tablespoons of the cooking water to make an emulsion with the butter. 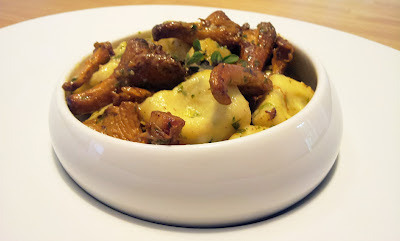 Poach the gnocchi and mushrooms for a few more minutes to infuse, then serve. Thank you for joining my blog and your very kind words. Sounds like it was a fun new experience and a real feast for such a special occasion. I hope this recipe goes down well, the potato ones are better known, but these are worth the little extra care needed to make them. I look forward to reading more of your posts over the weekend. Wishing you a happy weekend. These look wonderful. I buy ready made gnocchi but have never been brave enough to make my own. I also love mushrooms, but hubby does not, so I don't cook with them much at home. I am loving Nigellissima so far, although I have to confess I spend more time focusing on her fabulous kitchen than the food! Thank you for coming over, I can see you have a lot to do and a busy blog! You can send me a smiley face if you are very busy, I really understand. Thanks, you should try the gnocchi as they are really quick to do and wonderful! You could change the mushrooms for roasted slices of butternut squash and a sprinkle of crispy bacon. I was also spying Nigella's amazing ovens and not just the size of the kitchen, but that size in that post code!! These look wonderful, and more delicious than potato gnocchi! I can practically smell this dish! Thank you for visiting. I have been waiting for the mushrooms to arrive at the market for a few weeks now, so was happy to see them. The potato ones are good but these are lighter for an early fall supper! Hope you are enjoying your weekend. I came to say hi- and thank you for visiting me.,,,, I appreciate your kind words! I think your bloggy is beautiful- all that food and all! Please understand that I don't leave comments to comments- because my mommy is so busy that she never goes back to read more comments- I know that is confusing....and does not make sense! I am trying to talk my moms into letting me have some of the good foods you make! Wish me luck! Does your puggy get your special foods? Thank you for visiting and your kind words. I hope you visit often as I just visited your blog and saw your post on Cordon Blue, which brought back so many fond memories of 22 years ago when I studied there for a year. It hasn't changed and I could almost smell the place again! I hope you try this dish because I think we like similar foods and this is a favourite of mine, at this time of year. Oh how I'd love to spend an entire year at Le Cordon Bleu! I think you're quite right that we have similar tastes in food, and I've added you to my blogroll so I won't lose track of you!